Kids were dropped off at Power Engineers to the north and the old bowling alley to the south and picked up litter on their way back to school. It’s the seventh year of the College Aspiration Project, spearheaded by the tech teacher Krista Jones. Among the unusual finds were a moldy motorcycle helmet, a rusty railroad spike and even an untried scratch-off lottery ticket. No word from that finder whether the ticket was a winner. After 20 years in business, Iconoclast Books in Ketchum is facing closure due to mounting financial debt and challenges in the business environment. Before making a final decision, owner Sarah Hedrick is asking for the public’s input. Toward that end, Iconoclast Books will host a cocktail party and community discussion of the bookstore’s future on Friday, May 16, from 6-8 p.m.
“We deeply hope you can attend and pledge your support to us, in whatever form,” Hedrick said. The bookstore is on the corner of Sun Valley Road and Spruce Street. Each year, the Sun Valley Ballet School ends its dance season with two fun-filled evening performances. The ballet school instructs close to 140 students from ages 3 years to adult. These performances display an array of lyrical and classical ballet, jazz and hip-hop. The dancers have been working since February and are excited to share their talents with the audience and usher on three senior dancers, Lily Gillespie, Lena Perenchio and Arielle Rawlings, as they go off to college. Each one will be showcasing a special solo dance. The performances are Friday, May 16, and Saturday, May 17, at 6:30 p.m. at the nexStage Theatre in Ketchum. Reserved seating is available for $25 a ticket online at sunvalleyballet.com. General admission tickets will be available at diVine Wine Bar in Hailey or Chapter One Bookstore in Ketchum. Those tickets cost $17 for adults and $12 for children and students. For additional information, call 806-1441. No previous theater experience is required and there is a spot for all who audition. There is no cost to be in the show, but participants must make a solid commitment to a busy rehearsal schedule. Auditions continue today, May 14, from 3:30-6 p.m. at the Community Campus in Hailey. Rehearsals begin immediately on May 18 and the show runs from June 18-21 at the Community School Theater. The Summer Theater Project is a performing arts program sponsored by St. Thomas Playhouse. The entire community is also invited to audition for the humorous, fast-paced musical “Hello Dolly!” which is the 2014 selection for the inter-generational Family Main Stage performing arts program from St. Thomas Playhouse. No theatrical experience is required and anyone 5 years and older is eligible. The auditions take place on Saturday, May 17, from noon-2 p.m. at St. Thomas Church in Sun Valley and then immediately move south to the Wood River High School Choral Room from 3-6 p.m.
Auditioners will be required to sing anywhere from a few lines to a complete song from the show and read lines from a few scenes. “Hello Dolly” will run from Oct. 16-19 at the nexStage Theater in Ketchum and rehearsals will begin in early September. For more information, contact Sara at 726-5349, ext. 16, or sgorby@stthomassunvalley.org. See the website at www.stthomasplayhouse.org. The Papoose Club Plant Extravaganza at Webb garden centers is scheduled for Saturday, June 7. Garden centers are located in Ketchum and south of Bellevue. The organization’s next meeting will be held at the Liberty Theatre in Hailey on Monday, May 19, at 6:30 p.m., where the member of the year and lifetime members will be honored, including Danni Dean, Lee Dabney and Jennifer Card. At its April meeting, the Papoose Club awarded $5,452 to four organizations: Wood River High School Business Professionals of America, Bellevue Elementary PE, WRHS Track and Field, and Syringa Mountain School. Art Cures for Jenny Gatehouse is a benefit scheduled for Thursday, May 15, in Ketchum at Silver Creek Realty from 6-9 p.m. Organizers Levie Smith and Hallie Shealy are still gathering donations of art and money in preparation for the event. Cash can be donated to the Jenny Gatehouse Medical Fund, Box 5821, Ketchum, ID 83340—or call Smith at 720-4093 or Shealy at 721-7902. Art Cures raised funds previously to help local thespian and educator Keith Moore for his fight against colon cancer. Gatehouse is dealing with Parkinson’s disease, a disorder of the brain that leads to shaking (tremors) and difficulty with walking, movement and coordination. The Sawtooth Botanical Garden has announced the start of summer 2014 Wildflower Walks. The walks will be hosted by a different expert with changing locations and themes each Thursday from May 15 to July 31. The first walk, Thursday, May 15, in the Camas Prairie, will be led by horticulturist Carol Blackburn and birding expert Poo Wright-Pulliam. Meet at the Sawtooth Botanical Garden south of Ketchum at 9 a.m. or at the Timmerman roadside rest stop (at the blinking yellow light) at 9:30 a.m. Box lunches may be ordered for a fee or pack your own picnic. The day is expected to last until 5 p.m.
Plant enthusiast Braden Jon Anderson will show people how to assemble terrariums and other creature habitats on Saturday, May 17, from 2-4 p.m. at the Sawtooth Botanical Garden. Guests can bring their own container or purchase one on site. This is a free opportunity to create magical living worlds that can be enjoyed indoors all year-round. The public is invited to share in the results of a collaborative effort between Missy Lipton of Lipton Fine Arts gallery and the Community School’s Early Childhood Center art teacher Nichole Moos. The 3- and 4-year-olds in Moos’ class were inspired by all the different mediums of art that exist in Lipton Fine Arts and became engaged in drawing pictures for up to an hour in the gallery. The excitement of the experience led to an interest in having a show for the Community School Early Childhood Center children. Working with valley artist Jen Galpin, the children created works on paper for their exhibition at the gallery, which will be held Saturday, May 17, and Sunday, May 18, from 11 a.m. to 4 p.m.
“There’s a lot more to art than just a pencil and a piece of paper,” Lipton says. “Art is important to the education process. It exercises the brain in a different way. Lipton Fine Arts is located on Fourth Street next to the Coffee Grinder in Ketchum. The 11th annual Girls on the Run Community 5k & Healthy Living Expo is scheduled for Saturday, May 17, at Heagle Park in Hailey. 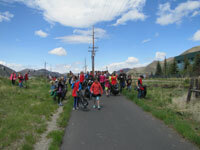 People are invited to come out to run, walk or stroll in the community-wide event that will wind through Draper Preserve and the Della View neighborhood in Hailey. The event will offer a post-race lunch for $5 per plate, a bike rodeo, inflatable games, crafts and other fun kid activities, a fire engine on display from the Hailey Fire Department and information from local nonprofit groups. Registration is online at www.girlsontherunwrv.org/5k, or Friday, May 16, at Sturtos Hailey from 5-7 p.m. Registration fees are $20 adults and $10 youth (17 and under). Runners will receive $5 off per registration when they register four or more people. Registration is available race morning from 8-9 a.m. at Heagle Park. Fees will increase race day to $25 adult and $15 youth. Those with motorcycles or four-wheelers are invited to a poker ride to raise money for the Lane Linhart Memorial Scholarship Fund on Saturday, May 17, at the Croy Creek Trailhead in Hailey. Registration for the 26-mile ride opens at 9:30 a.m., with the last riders out at noon. A $10 donation to the fund, created in memory of high school senior Linhart, who died by suicide earlier this year, is requested. This is an out-and-back ride on county roads in Rock Creek and Croy Creek, starting and finishing at the Croy Creek Trailhead. There will be a benefit raffle and silent auction at Mahoney’s Bar and Grill in Bellevue at 4 p.m.
For questions or additional information, email Riley Beck at rideforlane@gmail.com. The Hailey Public Library will become a “star lab” on Tuesday, May 20, at 5:30 and 6:30 p.m.
Join Hemingway Elementary Engineering Technology teacher Scott Slonim on a tour of a portable planetarium for a tour of the stars. Find out the stories behind the constellations. The Ketchum Street Fight is a high-octane team event in the strongman competition tradition with a twist. It will be held Saturday, May 17, at Ketchum Town Square starting at 10 a.m. Teams are made up of 1,000 lbs. of competitors, however many people that takes. The course is contained in 50 yards of 4th Street at the Ketchum Town Square and consists of a fire engine push, tire flipping, 100 lb. fire hose carry, 20-80 lb. sand bag carrying, throwing and dragging along with a 7-foot wall to scale. This year the event will benefit The Blaine County Drug Coalition and will feature two mystery events to be announced on the day of the event. The Ketchum Professional Firefighters Local 4758 are proud to partner with the Ketchum Fire Department and the Ketchum/Sun Valley Volunteer Firefighter’s Association as sponsors of this event as well as some of its most dedicated contenders. Several of the Ketchum and Sun Valley Volunteer firefighters are not only helping organize and run the event, but will also be fighting hard as competitors in this third annual Ketchum Street Fight. Anyone interested in participating call Capt. Tom McLean at 720-7717.